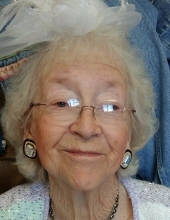 Katherine Gunn Hearp, 96, of Danville, Va., passed away on Monday, January 14, 2019, at Roman Eagle Rehab and Healthcare Center. She was born July 28, 1922, in Pittsylvania County, Virginia to Sallie Dunbar Gunn and William Allen Gunn. Mrs. Hearp was preceded in death by her parents and her husband, William James “Bill” Hearp, whom she married on February 13, 1946. She was also predeceased by her son-in-law, Rev. James “Jim” Stowe, three sisters and two brothers. She was a homemaker; she served the Lord for fifty years at Mt. Olivet United Methodist Church and was a member of the choir. She was a member of Shermont Baptist Church. Mrs. Hearp was a loving mother, grandmother and great grandmother. She was a graduate of Whitmell Farm Life School, class of 1941. She enjoyed fishing, going to church, going out with friends and visiting her children; she was loved by many friends. Mrs. Hearp is survived by her daughter, Judy Hearp Stowe of Dry Fork, Va.; her sons, Danny Hearp and wife, Geri of Dry Fork, and Tim Hearp of Danville; her grandchildren, Jim Stowe II, Joanna S. Handy, Justin Stowe, Wesley Hearp, Michael Hearp, Tyler Hearp, Sophia Hearp, Nikolas Hearp, and Charles Hearp; as well as her great-grandchildren, Cate Stowe, Sophie Hearp and Sadie Hearp. Mrs. Hearp also leaves behind her dear friend, Morris Payne, Sr. The family would like to extend their thanks to the staff and friends of Roman Eagle for all the loving care shown to their mother. Funeral services will be held at 11:00 a.m. Friday, January 18, 2019, at Norris Mt. Hermon Chapel with Rev. Ryan Riley and Rev. Mike Hearp officiating. Interment will follow at Danville Memorial Gardens. The family will receive friends from 6:00 to 7:00 p.m. Thursday, January 17, 2019, at Norris Mt. Hermon Chapel, and at other times at the residence of her daughter, Judy Stowe, 6397 Dry Fork Road, Dry Fork, Va.
Norris Funeral Services, Inc. & Crematory, Mt. Hermon Chapel, 3995 Franklin Tpke., Danville, Va. is respectfully serving the Hearp family. Online condolences may be made at www.norrisfuneral.com. To send flowers or a remembrance gift to the family of Katherine Gunn Hearp, please visit our Tribute Store. "Email Address" would like to share the life celebration of Katherine Gunn Hearp. Click on the "link" to go to share a favorite memory or leave a condolence message for the family.